Do you have a problem with wildlife animals on your property? Do you have squirrels or raccoons in your attic? Or animals behind your walls? 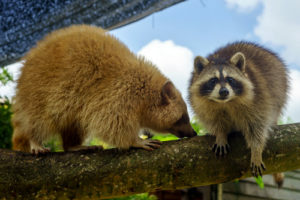 Wildlife and nuisance pests in your home are not just an annoyance, but they can pose some serious health problems as well. Wild animals and rodents may carry hundreds of diseases, can cause human or pet injury and even cause substantial damage to your home and belongings. Our Residential Wildlife Removal and Control services include home and property inspections, trapping and removing unwanted animals, managing wildlife access, repairing animal and pest damage and ensuring year-round monitoring and response to help alleviate homeowner concerns. Our expert services begin with a thorough inspection of your property, to find every potential access point, hiding place and breeding ground for unwanted wildlife and rodents. We provide quality animal removal and management solutions that are safe for your family, pets and home. You can depend on us to effectively and affordably capture and eliminate those uninvited rodents and wild creatures using humane and Eco-friendly methods. Our skilled wildlife removal professionals have access to the latest tools and technology. They use methods and treatments that have a low-impact on your environment. The services are effective against wildlife and pests with minimum risk to your family or your pets. Emergency Wildlife Trapping and Removal Services are available 24-hours a day. We know there are times when you need help quickly to remove animals from your home and property. Stuff happens, like if a frantic animal enters your house and can’t get out, or if you’re confronted with a rabid animal or poisonous snakes. Our Wildlife Removal Pros respond to emergency wildlife animal removal calls to help homeowners quickly and safely resolve issues. Why use BEDR Wildlife Removal? Contact us at 703-395-8622 today and take the first step toward a wildlife-free home.